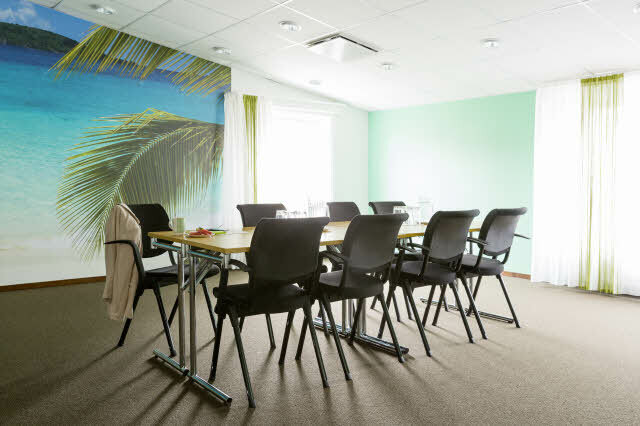 Enjoy the Caribbean heat at a hotel in Frederikshavn. At hotel Scandic The Reef, you can swim in the aquapark to the sound of tropical thunder and bird song. The hotel enjoys a central location close to the harbour. If you wish to visit Skagen or Blokhus, they are within driving distance of the hotel. Are you dreaming about the Caribbean heat, cold drinks and the sound of roaring waterfalls? Luckily, the Caribbean is no further away than our hotel, hotel Scandic The Reef, in Frederikshavn! In the large hotel aquapark, you will find palm trees, rocks and dangerous pirates. You’ll find adventures and a tropical atmosphere for children and childlike spirits alike. Try an 80-metre-long water slide, try to fight against the current in the canals or try to dive down to the bottom of the 3.5-metre-deep diving pool where you will find gold coins that can be used to buy ice cream in the bar. All year round, you can swim under an open sky in the heated pool, enjoy the spa or sunbathe on the sun deck in the summer. After a fun trip to the aquapark, we are ready for you with fantastic food in our restaurant Calypso and Det gule pakhus. If you are in the mood for a cool drink and a snack, the hotel has no less than 3 bars to choose from. If you want to host a different kind of meeting or event, for example an event that includes a trip to the aquapark, our conference department is ready to welcome you. If you are into traditional exercise and physical activity, we also have a modern gym with everything you need to keep in shape. Our hotel is centrally located in Frederikshavn, close to the harbour and the beach. From the hotel, you are also close to many of the attractions in Northern Jutland, such as Skagen, Blokhus and Lokken. You can also make it a fun day for the family at the Nordsøen Ocenarium or the amusement park Fårup Sommerland, just a drive from hotel Scandic The Reef. Welcome to one of our most family-friendly hotels. In summer and during select holiday periods, our best family hotels become even more fun. We offer all kinds of activities for kids including quiz games, film time and our cute hedgehog Sigge who also drops by.